Over the past year, we’ve been doing a #TBT (Throw Back Thursday) feature on the F&SF Twitter account and Facebook page. For the new year, we thought it might be good to add them here where they can be easily found under the “F&SF History” tag. 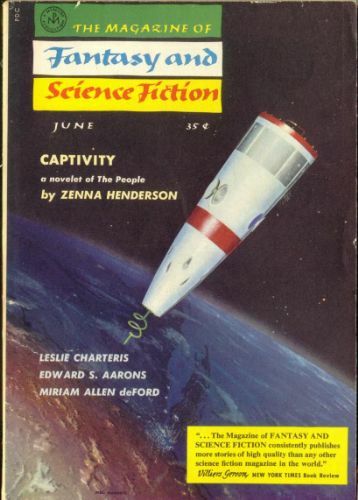 #TBT to the June 1958 issue of F&SF and this Mel Hunter cover illustrating a satellite. Sputnik, the first satellite, was launched into orbit in October 1957, so there was a lot of interest in the technology the following year. The issue leads with “Captivity,” a long novelet by Zenna Henderson in The People series. It was nominated for a Hugo in 1959. It was Henderson’s first award nomination, and one of several she received for books, stories, and a screenplay in The People series. The rest of the issue features an interesting mixture of authors and stories. “The Dreistein Case,” an epistolary story about an anti-gravity research debate, by J. Lincoln Paine was reprinted from The Washington Star. Paine was a pseudonym for Arnold Kramish, who worked on the Manhattan Project and survived the uranium enrichment explosion in Philadelphia. After the war, Kramish worked at the Atomic Energy Commission (as liaison to the CIA), the Dept of State, and for the Reagan administration as the chair of the study that recommended the Strategic Defense Initiative, or Star Wars program. And after =that=, he became one of the leading historians of the Manhattan Project and the nuclear era. “The Dreistein Case” concerns a scientist who wants research funding that isn’t forthcoming until Soviet advances in the field are revealed. Thematically, it’s a good fit with the Mel Hunter cover, and the first hint of Kramish’s future writing career. A good reprint choice by F&SF. “The Communicators” by Edward S. Aarons continues this theme with a story that takes place after a nuclear war between the US and USSR. Aarons was much more famous as a writer of mysteries and spy novels, including The Assignment series. That background shows here. He wrote one sequel to the story, “The Makers of Destiny,” that appeared in the September 1959 issue of F&SF. “Devotion” by Kit Reed is another uniquely Reed-ian proto-slipstream allegory about a man who loves his… well: “Harry Farmer loved his teeth.” But Harry is not a kindly or compassionate lover of other people’s teeth and the story takes a dark turn. “Services, Incorporated” is by the prolific writer and fan Rog Phillips. He received a Hugo nom in 1959 for his IF story “Rat in the Skull.” “Services, Incorporated” was translated and published in Japanese in 1960 during the first year of Hayakawa’s SF Magazine. In “Gathi,” Miriam Allen deFord (pictured to the left, image courtesy of Fantascienza and isfdb) uses a grove of sentient trees to explore how women support (and don’t support) each other. It’s a more sophisticated development of some ideas and themes in her earlier — and only second published — story “The Daughter of the Tree” (F&SF, Aug 1951). The last story in the issue is “The Questing Tycoon” by Leslie Charteris, a reprint of one of his Simon Templar adventures. There’s also a science essay by William Morrison, a poem by Karen Anderson, and book and magazine reviews by Anthony Boucher. In other words, it’s another typical issue of F&SF, with a wide range of entertaining and remarkable stories and features.